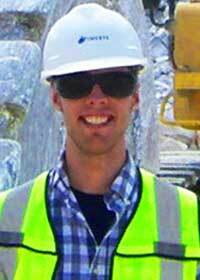 When graduate student and geology major Erik Van Dusen had the opportunity to secure an internship in his field this past summer, he dug in. Van Dusen had the pleasure of interning in Alabama with IMERYS, a large mining and mineral resources company that has hired some NIU graduates before. Through his studies, he looks at how fluids move through the Earth and how processes control their movement. He earned a bachelor’s degree at the University of Illinois before coming to NIU to pursue a master’s degree. Last fall, he opened an email sent by his department about a possible internship opportunity at IMERYS. He was definitely looking for more experience and took the initiative to email the contact and explain what he was working on. 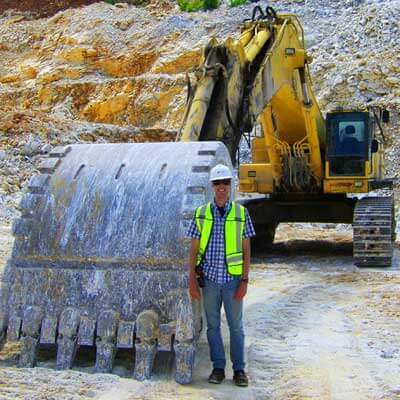 “I was most interested in the job description and structural geology aspect which was what I was studying. The fact that it was paid and a good opportunity to gain more experience also appealed to me,” he said. Van Dusen stayed in Alabama for the three months and lived in a house (all expenses paid) with other workers during his full-time internship. A typical day on the job included hands-on experience measuring elevations of mine pools and fracture mapping. He also did small lab work and looked for potential hazards to document in reports. Van Dusen, who plans to graduate this fall, would like to jump right into geology work. He would like to work either in the oil industry, environmental consulting or in mining. NIU Career Services’ Fall Internship Fair is planned from 10 a.m. to 3 p.m. Tuesday, Oct. 22, in the NIU Convocation Center. Admission is free for all students, and preparation help is available. A workshop on “Navigating the Fairs and Creating Your 30-second Introduction” will take place from 4:30 to 6 p.m. Monday, Oct. 14, at the Barsema Alumni and Visitors Center. The “ABCs of Getting an Internship Workshop,” sponsored by Kohl’s, is scheduled from 4:30 to 6 p.m. Wednesday, Oct. 16, in the Regency Room of the Holmes student Center. For more information, call (815) 753-1641 or email careerservices@niu.edu.